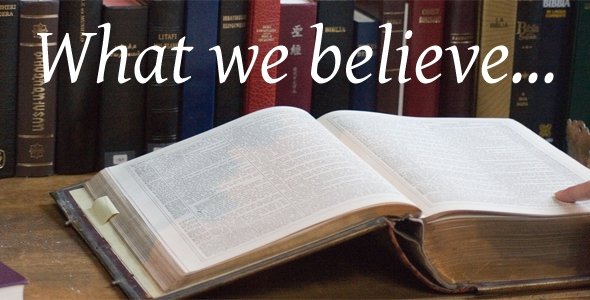 –We believe in the Bible as the written Word of God, which is inspired by God, and is fully authoritative and sufficient for Christian life and practice. –We believe in one eternally triune God who created all things visible and invisible, and out of chaos created order. –We believe that all have sinned thus breaking our relationships with God, self, others and the whole created order. –We believe that through his sinless life, sacrificial death, and bodily resurrection, Jesus Christ is the only sufficient atonement for our sins. –We believe that it is God’s will for us to live in holiness and it is through the empowering of the Holy Spirit that enables us to live holy lives. –We believe the Holy Spirit distributes a variety of spiritual gifts among all members of the church for accomplishing God’s purposes. –We believe that we experience the Reign of God as the presence, love, and power of God in our lives, in the church, in history, and in the whole created order, now and in the future consummation when Christ returns. –We believe the church is the fellowship of the redeemed, the body of Christ, the people of God, chosen by God for mission in the world. –We believe that all who repent and confess Jesus Christ as their personal Savior and Lord are part of the Church of God.